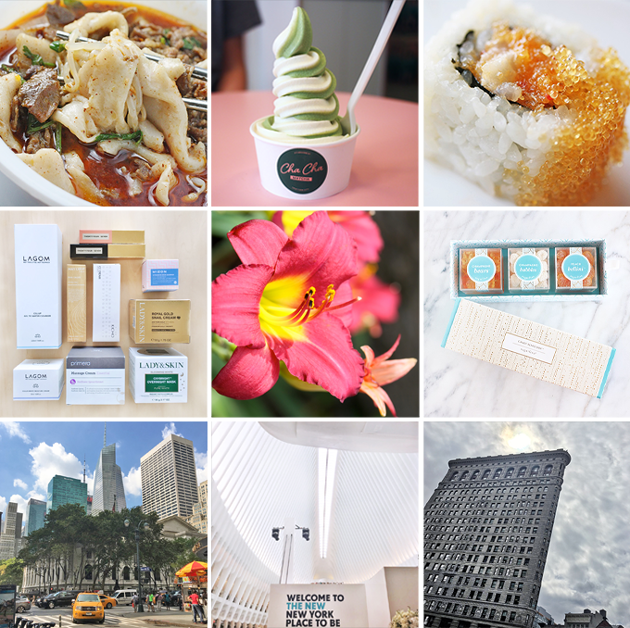 A few highlights of this past month as seen on Instagram which serves as my unofficial food diary and love letter to NYC. Whew did August fly by quickly or what? It was a good month and I'm excited for what September will bring. Even though a heat wave came through last month, I don't want summer to end and plan to savor every last minute that's left of it.For more, click on over to Instagram and do follow if you like what you see. Happy Labor Day to all my friends and readers in the US! The spicy beef noodles from Xi'an Famous Foods always hit the spot. Spicy food is especially appealing to me when it's hot. I only have ice cream a few times each summer so it's got to be the good stuff! Cha Cha Matcha's vanilla matcha soft serve is the good stuff. We also tried the rolled ice cream at 10 Below when we happened to walk by and there wasn't a crazy long line. Sushi makes me happy especially spicy scallop rolls with tobiko. My haul from the Peach & Lily sample sale. Already loving the 24/7 items! My husband received this Sugarfina Candy Bento set as a gift from one of his vendors. It included those Brut & Rose champagne gummy bears that everyone is talking about and they're good! Walking around midtown in between appointments. One of the things I love about NYC is how every part of this city has it's own unique energy. At the opening of the spectacular new Westfield World Trade Center Mall. It's great how far downtown Manhattan has come since 9/11 but it also makes me sad that it needed to be rebuilt in the first place. Moody skies over the Flatiron Building. I've been to the new Westfield Mall. It looks very impressive, especially the Eataly part. Just wow! Your IG account is definitely one of my favorites to look at, your photography is amazing. I'm following you now via IG... 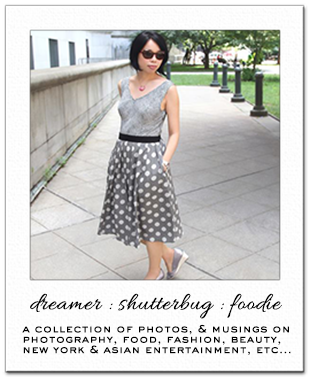 I love your instapics Rowena!!! I need that ice cream asap. HAHA! Thanks for sharing. Your IG feed makes me drool, Rowena! I swear you eat the best dishes. I plan to learn how to cook spicy beef noodles, it probably will take lots of trials and errors but I think it'll be worth it. I do follow you on IG so I've seen your food diary. :) Totally would love to eat that matcha ice cream and let summer last just a bit longer. And oh noes on Jealousy Incarnate!!! I will watch the first epi and see just because of Gong Hyo Jin but am not a big fan of too many characters either, which is probably why I haven't seen family dramas yet:P But that's good news about Fantastic though! :D One of my husband's relatives told me about Blood so I might see that one too! Spicy food is indeed best when it is hot! That icecream also looks yummy....and that flower is so beautiful. Great photographs, I always enjoy your instagram feed. Oh my these IG posts of yours always make me so hungry and I have not had lunch yet. I can't wait for fall and for it to get hold out, and that noodle soup is going to hit the spot!! The icecream looks so good! And the photo of the flower is beautiful! I've heard nothing but good things about Sugarfina! Their packaging alone makes me smile. HaHaHa Champagne gummy bears, just may make me like gummy bears again. I heard about the new Mall! From what I saw on social media it is gorgeous. Love what you got from the Peach & Lily sale Rowena. Enjoy! Beautiful insta pics, Rowena. Hope you had a lovely Labor Day. Such beautiful pics! I really want to give matcha ice cream a try... looks so yummy! Happy Labour Day Rowena! Your pictures are like taken from a page from Pinterest and you are one of those guilty of making me drool at my screen. New York is so great! Seeing this reminded me how much I want to go back! Love these posts of yours!! I can't believe August is already behind our back, that's why I am trying to take the maximum of the remaining summer, although it's been quite cool these days. I also love sushi but it's hard to find a good sushi restaurant here. Your IG photos are always pretty. Are they taken with your camera or iPhone, Rowena?